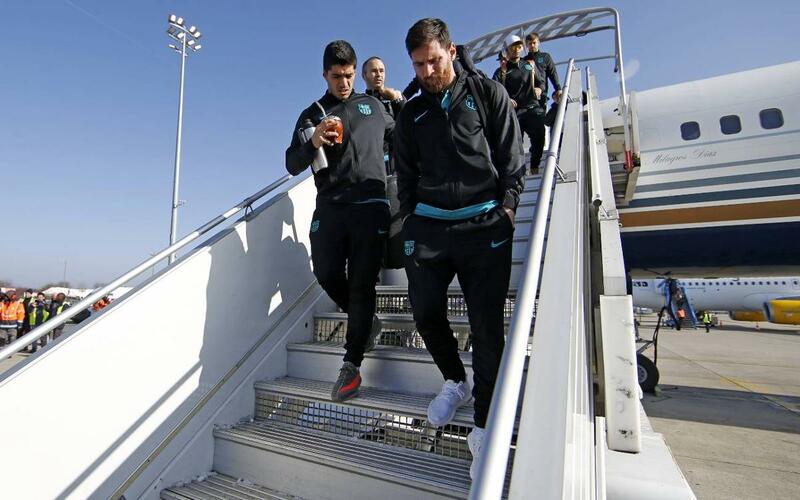 FC Barcelona are in Paris! FC Barcelona departed from Barcelona El-Prat Airport at 10.50am on Monday morning and flew north to Paris, France, arriving in the French capital at 12.10pm. Barça face Paris Saint-Germain on Tuesday night in the first leg of the UEFA Champions League last 16. Upon arrival, the team took a bus to their hotel to rest before an early evening training session at Parc des Princeps, the site of Tuesday’s match. Barça and PSG have faced off plenty of times on Europe’s biggest stage in recent years, with the Catalans holding the edge with 3 wins, two draws and a single loss versus the French outfit. Statisically, Tuesday's matchup should be very intriguing. The Club’s expedition is being headed up by the Vice President, Jordi Mestre, and by the Board Members, Jordi Moix, Javier Bordas, Silvio Elías, Josep Ramón Vidal-Abarca, and Oriol Tomàs. Barça manager, Luis Enrique Martínez summoned 21 players for the trip to Paris, including Rafinha, Gerard Piqué, Jordi Masip, Nili, and Aleñá. Three of the 21 will be eventually be left out of the game-day squad in order to comply with the maximum of 18 players who may dress for the match.